This course will introduce you to the principles of architectural planning and design. Because architectural design is largely a subjective process, the “casebook” approach is used to illustrate it. 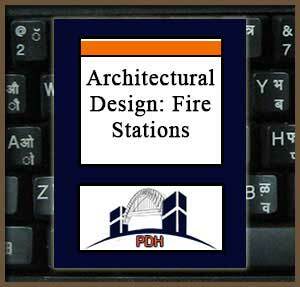 In this instance, the architectural design of fire stations is the “case” to be discussed. You will learn about space allocation criteria, core functional areas, site evaluation and location, general design guidelines, site design, and building design criteria. You will learn criteria for selection of furniture, fixtures and equipment for all of the functional areas in fire stations. You will learn how to develop and apply functional relationship diagrams for all areas of a fire station. This course will give you the fundamentals you need to address fire station construction planning and layout for design projects in your day-to-day practice and activities. Learn about space requirements for apparatus and maintenance. Learn about space requirements for training, administration and on-duty living. Learn how the class of trucks assigned to a fire station drives the requirement for apparatus space. Learn how space requirements differ for Structure fire stations and Aircraft Crash and Rescue stations. Learn the factors that determine the most appropriate and cost-effective location for a fire station. Learn about layouts and adjacencies, and how to use functional relationship bubble-diagrams to analyze them. Learn about the different layout requirements for satellite, main, and large main fire stations. Learn about space and layout requirements for apparatus bays for different truck and equipment assignments. Learn the basic room layouts for administrative, dispatch and on-duty living spaces in a fire station. Learn when information technology (IT) space will be required at a fire station, and how much will be needed. Learn space program recommendations for apparatus, equipment and maintenance. Learn space program recommendations for administrative and training spaces. Learn space program recommendations for residential and living spaces. Learn when other spaces may be required at a fire station, and how much space may be needed. Learn the basics of fire station organization and circulation.